The main battle tank’s first-generation comprised medium tanks designed and produced directly after World War II that were later redefined as main battle tanks. The main battle tank then began to approach a plateau of core design from the mid-1960s with the advent of second-generation vehicles such as the British 121,250-lb (55000-kg) FV4201 Chieftain, French 79,365-lb (36000-kg) AMX-30, West German 88,185-lb (40000-kg) Leopard 1, Soviet 80,470-lb (36500-kg) T-62 and US 108,000-lb (48985-kg) M60, all armed with high-velocity main guns in the calibre range between 120 and 122 m (4.72 and 4.8 in), possessing different thicknesses of armour reflecting their parent countries’ differing protection/mobility priorities, powered by Diesel or multi-fuel engines with advanced transmissions to drive wide tracks, possessing suspension systems offering excellent cross-country mobility and great reliability, and fitted with improved night-fighting optics and, in most cases, a package providing crew protection in conditions of nuclear, biological and chemical warfare. 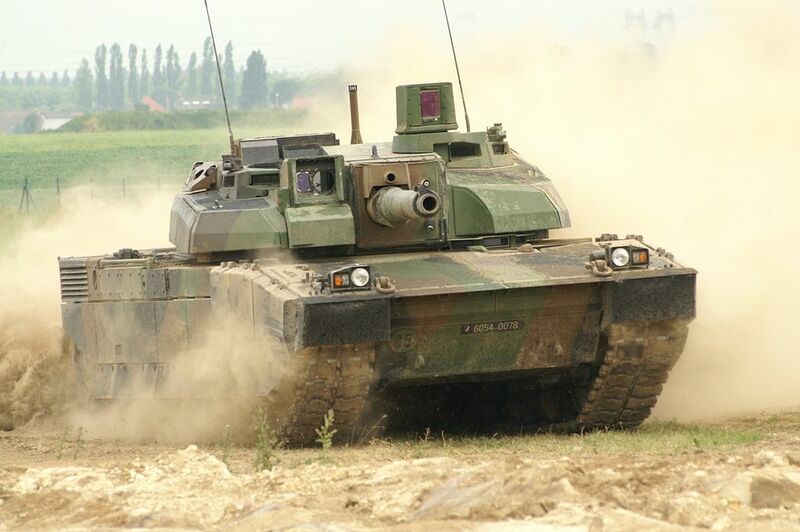 Since the mid-1970s there have been third-generation main battle tanks with main guns in the calibre range between 120 and 125 mm (4.72 and 4.92-mm), composite armour, and a combination of computerised fire-control systems, stabilised optics and a stabilised gun to allow firing on the move as well as very high first-hit probability on targets at ranges up to 2,200 yards (2000m). This generation is epitomised by vehicles such as the British FV4030 Challenger, French Leclerc, German Leopard 2, Israeli Merkava, Soviet T-80 that was the world’s first tank powered only by a gas turbine engine, and US M1 Abrams. Originally main battle tanks relied on steel armour for protection, but as more modern threats started to emerge, main battle tank protection began to become more complex and effective. 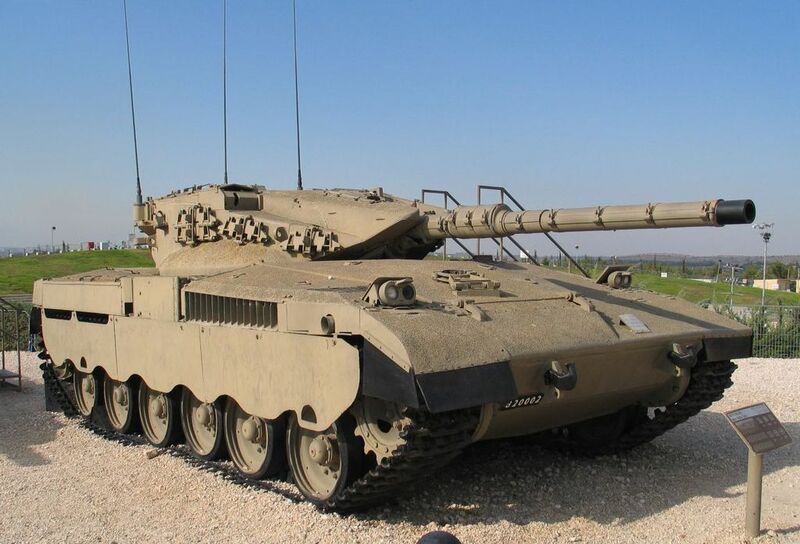 One of the first new developments was the use of explosive reactive armour, developed first by Israel in the early 1980s to defend against shaped-charge warheads of modern anti-tank guided missiles and other such high-explosive anti-tank (HEAT) projectiles. Technology of this type was then adopted and improved by the USSR (now Russia) and the USA. The main battle tanks in armoured on every surface (hull sides, front, rear, belly and decking, as well as the turret, the thickness varying with the criticality of the interior volume covered the the probability of a hit in that area, but the thickest armour is concentrated at the front of the tank’s hull and turret, where it comprised layers to a thickness of 330 mm (13 in). Missiles are cheap and cost-effective weapons in the anti-tank role, and explosive reactive armour can be added over the inbuilt multi-layer primary armour to increase survivability. However, the detonation of the blocks of explosive reactive armour can be hazardous to any supporting infantry close to the tank. Even so, it is still employed on many Russian tanks, the latest Kontakt-5 being able to defeat both HEAT and kinetic-energy penetrator attacks. The Soviets also developed systems for the active rather than passive (reactive) neutralisation of incoming projectiles before they can impact the tank, namely the Shtora laser and Arena missile systems. More recently the USA adopted similar technologies in the form of the Missile Countermeasure Device and as part of the Tank Urban Survival Kit. Other enhancements have been concentrated on improvements to the strength of the armour itself. The most notable early successes in this field was the British Chobham armour, which was developed in the 1970s to deflect and deform the effects of an impacting warhead or penetrator. 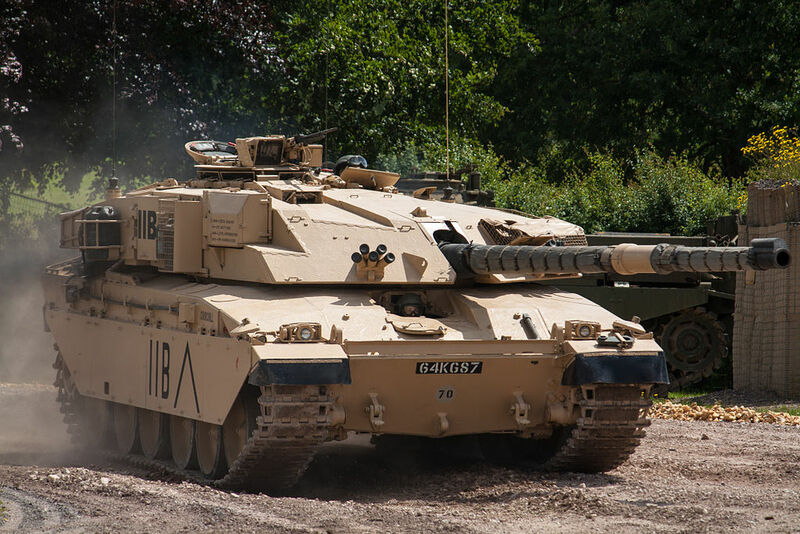 It was first employed on the US M1 Abrams and later on the British Challenger 1. This type of armour is based on the use of a lattice of composite and ceramic materials along with metal alloys to defeat incoming warheads, and proved highly effective against weapons such as Soviet rocket-propelled grenades. The armament of the main battle tank is one large-calibre gun and at least one machine gun. The main gun has generally been of a calibre between 90 and 130 mm (3.54 and 5.12 in), and is a long weapon able to fire anti-armour and, more recently, anti-personnel rounds. The gun is therefore a dual-role weapon capable of engaging other armoured targets such as mobile tanks and fixed fortifications, and soft targets such as light vehicles and infantry. The main gun is located in the turret, which provides 360° powered traverse at a comparatively high rate, together with its loading and firing mechanisms. The main gun is aimed and fired in modern main battle tanks with the aid of an advanced fire-control system that includes stabilised optical and laser rangefinders, sensors to provide data on the external temperature and wing speed and direction, and tilt indicators. All these feed their readings into the fire-control computer for the generation of a firing solution for the main gun, which is also stabilised so that it can be aimed and fired accurately even if the hull is turning, pitching longitudinally or laterally, or shaking: this makes it easier for the gunner to fire on the move and/or against moving targets. Guns capable of firing a projectile or a missile have also been developed and fielded, but are complex, tend toward unreliability, and have been notably unsatisfactory in the USA, which abandoned gun/missile projects such as the M60A2 and MBT-70. The standard anti-armour ammunition of the modern battle tank comprises HEAT and high-velocity kinetic-energy penetrator types. The latter is best characterised by the APFSDS (Armour-Piercing Fin-Stabilised Discarding Sabot) round, in which a large propellant charge fires a full-calibre payload which discards its calibre-filling sabots at the muzzle to release a small-calibre finned penetrator, with a diameter in the order of 20 mm (0.79 in), at a velocity in the order of 5,700 ft (1737 m) per second. This penetrator is made of a high-density material such as depleted uranium or tungsten, and flies on a very flat trajectory to hit and penetrate its target. Anti-personnel rounds are also carried, and these are most commonly of the HE or HE-Fragmentation types. Rarer projectiles are the Beehive anti-personnel round carrying some 8,000 flechettes released in flight, and the HE Squash-Head (HESH) round used for both the anti-armour and bunker-busting roles with the HE charge squashed against the outer surface of the target before detonation, which its designed to propagate a shock wave through the target and case large pieces of metal or concrete to spall off the inner surface and ricochet round inside the target. The main battle tank typically carries some 30 to 50 main-gun rounds, usually a mix of HE, HEAT and kinetic-energy penetrator types. Some vehicles may also carry smoke or white phosphorus rounds. Some main battle tanks, such as the the French Leclerc and the Russian/Ukrainian T-64, T-72, T-80 T-84 and T-90, have a main armament autoloader, and for this reason have a crew of three rather than the more typical four as the incorporation of an autoloader removes all need for a gun loader. The autoloader also occupies a smaller volume than a loader, and this allows the size of the turret to be reduced, with useful benefits in terms of lowering the tank’s visual profile and thus its optical detectability. Moreover, the autoloader can be designed to handle rounds which would be too difficult for a human to load. On the other side of the tactical coin, however, when the turret and fighting compartment are designed with a loader as part of the crew, the main-armament rounds can be isolated in a blow-out compartment, which vents to the outside of the tank should the ammunition be detonated by a hit. This provides greater crew survivability than is possible with a detonation in the autoloader’s magazine, which is usually inside the turret. The main battle tank’s secondary weapons are usually two to four machine guns for the engagement of light vehicles and infantry. Many main battle tanks carry one heavy-calibre machine gun, such as the 0.5-in (12.7-mm) Browning or DShK, on their turret roofs for use against helicopters and low-flying aircraft. Their capability is very limited by comparison with that of dedicated anti-aircraft weapons, however. The main battle tank generally carries between 500 and 3,000 rounds for each of its machine guns. Like all tanks, the main battle tank moves on a pair of tracks, each comprising linked plates. This provides for a good degree of mobility over most types of terrain, including sand and mud, and also makes it possible for the tank to climb over most obstacles and to pass over comparatively wide gaps such as trenches. The main battle tank is also waterproofed and can wade though shallower rivers or, if fitted with a snorkel system, drive though water up to 16 ft (5 m) deep. What cannot be denied, however, is that the tracked main battle tank is not notably fast, with a maximum speed in good conditions of about 40 mph (65 km/h). Speed is also a main battle tank factor which suffers from the weight of the vehicle, which can be as great as 155,000 lb (70310 kg), despite the use of engines capable of delivering between 1,200 and 1,500 hp (895 and 1120 kW).